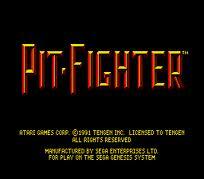 All games in tagged with "Pit Fighter"
Pit-Fighter is a 1990 arcade fighting game by Atari Games, notable for its early use of digitized live actors. The Japanese arcade release was published by Konami.The graphic animation for the player character(s) and opponents were created through a bluescreen process, where the various poses & moves of the characters were acted out by hired actors in front of a video camera. The game's on-screen character animation are replays of the actual footage, not a rotoscoped (redrawn) animation as was common in other games. Pit Fighter was the second fighting game to use digitized sprites, after Home Data's Reikai Dōshi: Chinese Exorcist.